Book a motorhome or campervan hire in Melbourne with VroomVroomVroom, and plan your trip to Australia's second largest city. 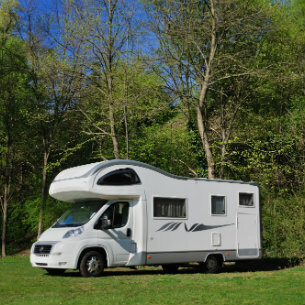 We compare RV rental deals from major suppliers such as Apollo, Britz, Maui, Jucy and Real Value. A campervan is a popular way to explore and discover the area, which features popular routes such as the Great Ocean Road. For extra comfort, consider hiring a camper while you explore the city of Melbourne. Check out our car hire deals in Melbourne if you are looking for a smaller vehicle. Victoria's state capital is full of interesting sights and unforgettable activities. Melbourne is a multicultural city. It is rich with Victorian buildings, magnificent parklands and shopping destinations. It also features cultural precincts such as Chinatown. Explore the Dandenong Ranges, hike, windsurf and play tennis. If it is your first time to drive in Melbourne, you may want to check out these tips. Ashley Gardens BIG4 Holiday Village - Aspen Parks lies at 129 Ashley Street in Braybrook. It is a popular holiday destination, around nine kilometres from Melbourne. It has disabled facilities; a playground, barbecue facilities and a camp kitchen. Visitors can also enjoy a recreation room, pay TV, a full-size tennis court and a heated swimming pool. The campsite's top activities are camping, swimming and tennis. BIG4 Dandenong Tourist Park is at 370 Frankston, Dandenong Road in Dandenong South. The park has beautiful scenery. It is also very close to central Melbourne. Port Philip Bay, the Dandenong Ranges and Phillip Island are also close by. Its campsite facilities include a covered barbecue area and a recreation room. The park also has double concrete patios on each of its shady sites. Find the Melbourne BIG4 Holiday Park at 265 Elizabeth Street in Coburg. The site is around nine kilometres from the central business district of Melbourne. It has a wide range of accommodation and facilities. Its campsite facilities include a barbecue, camp kitchen and a recreation room. There is also a playground and swimming pool ideal for people travelling in a campervan. Check out our Top 7 Caravan and Holiday Parks in Australia and New Zealand. We have come up with a list of places where you can make the most of your campervan holiday. 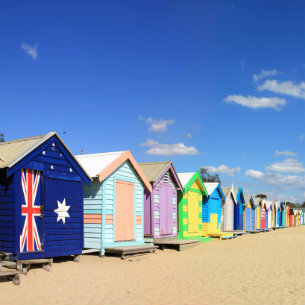 Brighton Beach lies eight kilometres south of Melbourne. It features coloured beach huts, relaxing sands and picturesque views of the city. On a sunny day, the colour of the huts is striking against the yellow sand and blue skies. Chinatown Melbourne is along Little Bourke Street in Melbourne. It goes back to 1851 to the discovery of gold in Australia. It has since served as home to many Chinese migrants. The area's highlight is the Chinese Museum. The area also features stores and affordable yet great tasting food. It is also known for the diverse eateries. Find Singaporean, Thai, Japanese and Indian food. Dandenong Ranges are the picturesque low mountain ranges in East Melbourne. The area also features many beautiful little villages. The heritage Puffing Billy Railway is a great way to explore the Dandenong Ranges. The Royal Melbourne Zoological Gardens or Melbourne Zoo lies within Parkville, Melbourne. It is around four kilometres from the city centre and is great for people of all ages. The zoo first opened on 6 October 1862. It is home to over 320 animal species from Australia and many parts of the world within 55 acres land. The zoo's major exhibits include elephants, gorillas, lions, orangutans and tigers. Queen Victoria Market is on the corner of Elizabeth and Victoria streets. The market opened on 20 March 1878 and is currently one of the most popular destinations in the city. The venue hosts stalls that sell a wide variety of items. These include fashion, jewellery, arts and crafts. Also find fresh produce like fruits, meat, and vegetables.